Ibn al-Sa’i’s Consorts collects portraits of 39 women associated with powerful men in the tenth through thirteenth centuries. The women are by turns clever, bold, musical, accomplished poets, beautiful, pious, loyal, and generous. In the interview that follows, Toorawa talks about why it’s not so embarrassing for Ibn al-Sa’i to write about the lives of women, how the LAL editors became comfortable translating jariyah as “slave,” and ways in which he’d like to teach with this text. This is a wonderfully fun book. But wasn’t it a bit of a step down for Ibn al-Sa’i, as a historian, to focus so much on the lives of (mere) women? What would his contemporaries have thought? They would not have perceived it that way. One way to think about it is this: In order to be a good historian, you have to be comprehensive. You cover all the bases. These women are interesting to him. He was so interested that he wrote two books about these women, but the one about the women who lived to see their sons became caliph is lost. This means that he is interested in them because of their connection to these people who he believes do make history—men. It’s also the same kind of question people ask about al-Khateeb al-Baghdadi, who writes Ta’reekh Baghdad (The History of Baghdad), this amazing fourteen-volume work of anyone important who was ever in Baghdad. There are women in it, but basically it’s about men. Al-Khateeb also writes a book about party crashers [The Art of Party Crashing in Medieval Iraq, translated by Emily Selove]. There are different theories about why these authors wrote such books. Sometimes it was to show virtuosity. Sometimes they were practice works—they were practicing their ability to gather disparate material. But we mustn’t forget that these guys are real intellectuals, that they’re interested in everything. For contemporary readers, there’s something of a supermarket check-out line, “Lifestyles of the Rich and Famous” appeal to Consorts. Who would’ve read it in its time? Obviously it wouldn’t be sold in supermarkets. Now, was it being sold widely in bookshops the way other things were being sold? I don’t know. Four hundred years earlier it would have been. But at this time, it’s not clear to me who was reading it. He wrote it right before the fall of Baghdad. He’s a librarian at a law college. He writes this work and he looks [back] at the Golden Age, and it’s hard to tell if he’s approving or disapproving. He’s not disapproving intellectually of it, but the women he’s celebrating are the latter-day women, the women who are pious. I assume the idea is that the people who choose to marry them make good choices in marrying them. How is it the pious women being celebrated? It’s the witty women who are more interesting and fun. It’s a paradoxical thing, since the book seems to be at cross-purposes. On the one hand, I think he’s saying, there was a Golden Age. There was a Baghdad when Baghdad was great. And the women from then were witty and well-educated, and that’s something to aspire to—that level of culture. By putting them in the same book with these latter-day women who aren’t as accomplished, there’s a sense in which it’s a continuum. We continue, he’s saying, to be a cultured civilization. The paradox of course is that many of the latter-day women are free-born. He doesn’t say that he wants the earlier age to be restored. Is there a reason the women’s profiles aren’t in listed in chronological order? It may be that he hadn’t quite sorted out how he wanted this book to look. He might’ve still been trying to work through the following question in his mind: What do I think the role of the wives and favorites of the caliphs is, both as exemplar and as historical fact? Julia Bray’s introduction indicates that Ibn al-Sa’i and others were freer to explore the lives of slaves than they were to explore the lives of free women. They were a commodity, and thus more open to our scrutiny? I think it’s fair to say, based on the historical record, that we have very little information about the private lives of free-born women, generally, in the Arab-Islamic world, unless there’s some other thing that makes them important. Authors just didn’t record information about the private lives of prominent women. There are countless male authors about whom we don’t know even whether they were married or had children. And it’s the case that slave women, notably the ones that were connected to caliphs, are people about whom people felt they could write. 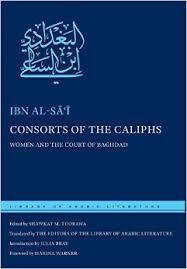 One of Ibn al-Sa’i’s principal sources regarding slave women, is al-Isfahānī’s thirty-volume Kitāb al-Aghānī [Book of Songs]. He’s a cultural and literary historian, and he’s interested in the fact that the slave women are poets, and that makes it okay to write about them, because the tradition writes about poets. We do know about Wallada [bint al-Mustakfi], a free-born woman in Spain. And why do we know about her? She’s a poet. Most of the time, it’s because of their professional or vocational position: women poets, women scholars, women who love djinn. Even if it’s marginal like that, it’s a category about which people get interested as a category. There isn’t a book called The History of the Private Lives of Abbasid Housewives, and I think it’s because they didn’t think of them as a category. It’s not different ideas of privacy? It’s also connected to different ideas of privacy, or just ideas of privacy. But I don’t think the Abbasids are that different from us. I don’t think we write about the lives of private women, either. Except for TV shows like Housewives [of Orange County, of New Jersey, of Atlanta]. And that’s so private, in a way that seems kind of odd. Whereas it’s not so odd if it’s the lives of the rich and famous. Have you thought about how you’d teach this text? I would love to teach it. I’ve actually suggested it to one of my colleagues, who’s talked about teaching something about free and un-free women. Other books that could go with it: [E.T.] Dailey’s Queens, Consorts, and Concubines, about Merovingian elite women. And there’s a book called Courtesans, Concubines, and the Cult of Female Fidelity, [by Beverly Bossler], which is about China. I can imagine a course that focuses on medieval Europe, medieval Baghdad, and late-medieval China — not so much to compare, but to contrast. How does this get recorded by male historians, what matters? The question of fidelity is really interesting. What does that even mean? Recently, I taught a medieval travel-narrative class, and the students loved it. For my final assignment, I had them write a narrative of one of the trips they’d taken as kids in the style of any of the authors that we’d read, and several picked either [al-Sīrāfī’s] Accounts of China and India or [Ibn Faḍlān’s] Mission to the Volga, both from a LAL book! What was good about the exercise is it got them to think about what matters to this author. If I ever taught Consorts of the Caliphs, I’d want them to do something similar: I’d have them write biographies of important women in the style of Ibn al-Sa’i. The topic of fidelity does recur throughout Consorts of the Caliphs. Right. But I don’t know if they would think about it as fidelity. In your introduction, you talk about an earlier version of this translation, which you’d worked on with RRAALL, and you described this version as “Englishing the Arabic.” What’s the space between “Englishing the Arabic” and a good translation? Effectively, “Englishing the Arabic” is what we’ve been calling “Industry Standard Arabic,” which is the acceptable standard currently. You could make the argument that this is often a kind of archaic English. Fine. If you are intentionally making it sound that way, then it’s archaic English. But our initial version of Consorts of the Caliphs sounded wooden. We wanted to move away from it sounding wooden. It was okay if it sounded strange, of a certain antiquity, of a different culture, of a different context. But why would we want it to sound wooden? Why would we want to make a librarian and a historian of Arabic literature sound like he wasn’t very smart? When I was trying to demonstrate this to my students, I gave them a passage in Industry Standard, to show them that you can actually “hear” the Arabic. If you know Arabic, you can hear it. If you can’t hear the Arabic when you read the English, then it’s a successful translation from a LAL perspective. This became clear to us in everything we tackled at LAL. When we picked up a translation of Aristotle from Greek, it didn’t sound wooden. It doesn’t sound like you’re reading Greek. It sounds like you’re reading English. Why, then, when we pick up a manual of legal theory in Arabic, does it sound like you’re reading Arabic? Why not find the idiom? At the level of lexeme an example I like is sunna. I remember asking Joe Lowry, who translated the Epistle on Legal Theory for LAL, Why don’t you translate sunna? And he said “everyone knows what it means,” and I said: “What does that mean that everyone knows what it means?” The person who buys the book, who’s interested in legal theory, that person is not going to know what sunna means. Which reminds me, I just read an article by Kevin Reinhart, which I hadn’t read for many years, and I’d forgotten that he renders sunna “normative acts,” which is actually an excellent English translation. Have you gotten pushback from partisans of Industry Standard? I don’t think so, not in print — but we’re about to. We’re working on a translation of the diwan of ‘Antarah, and when you see some of the choice we made, there are times when it’s difficult to even work out what the relationship is between the line in English and the line in Arabic. Because we’ve done things like translate [a line as] “Warriors. Hold your ground” when the Arabic is some long line about pulling the reins and God knows what else. It’s about meaning. What we’re trying to say is: How do we make this mean in English? Not how do we make it a poem, but how do we make it mean. So we’re going to get a lot of flak when the poetry comes out. With the poetry in Ibn al-Sa’i, we stuck pretty close to the Arabic. A purist can’t get too upset. The person who really cares can read the Arabic, and the person who doesn’t know a word of Arabic shouldn’t be worrying about it. As many of us maintain, having the Arabic on the left liberates you. In the introduction, you noted that there was a long discussion over the translation of the word “slave” for jariyah. Yes, it was a long discussion. It was one of the first things we discussed, because it comes up tight away in the book. One potential translation was “singing girl.” A group of editors said: First of all they’re not girls, and anyway it demeans and is inaccurate. Another group said: But we want to convey that it’s demeaning. Not everybody agreed. People who study Abbasid Baghdad know very well that they were slave women, but think of them as important cultural figures, not as singing girl, or slave girl. So we thought about “slave woman.” But then someone pointed out that if we’re going to be using the personal pronoun she throughout, then it’s going to be clear that they’re women. With every rendering, the important question is: Do we go with what it means, or are we worried about conveying in the English something that you can get from the Arabic? In the end, we became increasingly comfortable with slave. Someone pointed out, later on: What about the problem of the American imagination, about slave evoking the North Atlantic slave trade? And we said: How does “slave girl” take care of that? It doesn’t. We decided as a group, it does mean slave after all. That’s what it means. We also were happy about the fact that if anyone took this seriously from outside the discipline, it could enter the discussion about slavery, as opposed to a kind of precious “singing girl” thing that we keep as a preserve of Arabists who study the singing girls of Baghdad. It’s part of a larger phenomenon of slave-owning. Were there other words or concepts that you discussed that extensively? Yes, the names. That was a very big question: Do we translate the names of these women [being profiled]? We were excoriated at an early public event in Abu Dhabi by people incensed that we thought it was okay to translate these women’s pet names. This was an audience of expatriate mainly Arabs and Muslims. They weren’t offended, but they were taken aback. When we started out as RRAALL, we thought James Bond women names would work. They’re powerful, but they’re sexualized. But we were made to realize, it’s just not that simple. We decided that we that we would translate the names of all those who were slaves, but not of any who were free-born. Someone had raised the issue: Why aren’t we translating the caliph’s regnal title? A couple of us made the case that people don’t think about what those things mean. They can, but they don’t. It’s become a name. And that’s because they’re free-born. We’re very happy with what we settled on. We give the actual name in Arabic, then we provide a translation in quotes so that it’s clear that it’s a kind of pet name. And then we use the regular Arabic name again in the context of the anecdote. So we don’t completely fetishize it, but we also don’t protect the English reader from what would’ve been clear to anyone. If you meet someone and their name is Farah. It’s just like if you meet someone whose name is Faith or Hope — you don’t think about it. But if someone’s name was Treachery, you would notice. Excellent discussion; for me as a non-Arabic reader, it gets to the heart of the translation dilemma. Pretty much anything Shawkat says is worth a listen. Glad you stopped by!